The University of Michigan Future Public Health Leaders Program (U-M FPHLP) is a 10- week residential summer program that provides students with opportunities for growth, learning, and awareness in the field of public health. FPHLP students will be introduced to public health careers, strengthen and broaden their leadership for addressing health equity, increase their awareness of health disparities, build practical experiences, and develop a baseline understanding of the intersecting issues around public health. Housing and transportation are provided to selected participants, as well as a stipend to cover additional living expenses while in the program. Applications open November 1, 2018. The deadline to apply is January 31, 2019 11:59pm EST. Doyon Foundation is pleased to announce a call for an evaluator for the Doyon Languages Online project. Interested parties are encouraged to view the RFP (request for proposals) and submit required application materials. The position will be open until filled. The selected evaluator will work with the project manager of Doyon Languages Online II, which is working to create 224 introductory online lessons for four of the endangered Doyon region languages: Nee’aanèegn’ (Upper Tanana), Dihthaad Xt’een Iin Aanděeg’ (Tanacross), Deg Xinag, and Dinak’i (Upper Kuskokwim). The effort is in partnership with the Iditarod Area School District and the Alaska Gateway School District. In 2017 Doyon Foundation received a three-year, $977,423 grant from the U.S. Department of Education – Alaska Native Educational Program for this work, which builds on the progress of the existing Doyon Languages Online project. Doyon Languages Online is currently in the process of developing online language-learning lessons for five of the Doyon region languages: Holikachuk, Denaakk’e (Koyukon), Benhti Kenaga’ (Lower Tanana), Hän, and Dinjii Zhuh K’yaa (Gwich’in). Together, Doyon Languages Online and Doyon Languages Online II will produce online learning opportunities for nine of the 10 indigenous languages of the Doyon region. The project is a partnership with 7000Languages, a nonprofit that supports endangered language learning partially through software donated by Transparent Language Online. Interested applicants should complete the online application and submit a cover letter, resume and evaluation proposal (scope of work). The proposal should include a project description, timeline and budget. Applicants are encouraged to contact the Foundation with questions prior to submitting a proposal. For more information on the project scope, background, qualifications and selection process, and to access the application, please see the evaluator RFP for details. For additional information, visit www.doyonfoundation.com or contact Allan Hayton at haytona@doyon.com or 907.459.2162. 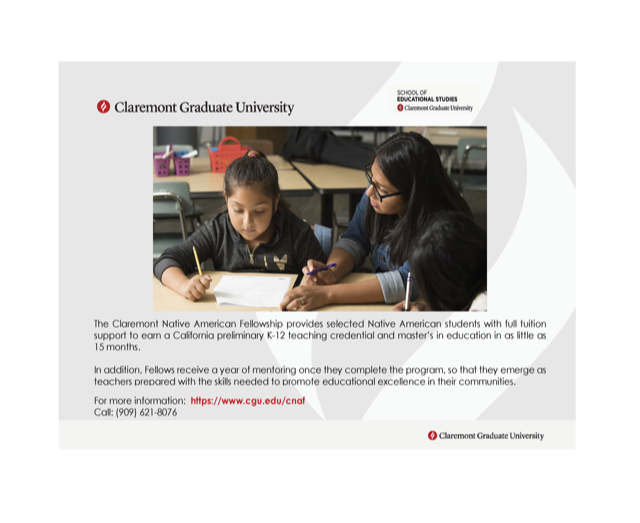 Claremont Graduate University (CGU) has a partnership with the US Department of Education that will allow us to provide full tuition, living stipends, and a year of post-program mentorship to Native Americans who want to earn a master’s degree in education and a California teaching credential (which can also be used to teach in other states). To learn more about the Claremont Native American Fellowship, visit the CNA Fellowship web page, and learn more by reading the FAQs . Policygenius, the easy way to compare and buy insurance, will award one scholarship to a college student for the Spring 2019 semester — because the best path to financial protection is to start young. Assignment: Write an original essay answering the following questions: What future financial goal are you most worried about achieving? What steps are you taking now to help yourself achieve it? The Northern Alaska Indigenous Leadership Academy (NAILA) seeks to help address Alaska Native community-based wellness and sustainable development through investment in transformative training of local leaders. Iḷisaġvik College and the UAF Department of Alaska Native Studies and Rural Development invite you to apply to the 2019 NAILA cohort. NAILA is a dynamic and transformative academy, integrating best practices from successful leadership development and training programs. Participants will engage in a series of audio-conferences in preparation for a face-to-face weeklong intensive program, designed in a retreat format. Participants may earn credit either through UAF or Iḷisaġvik College. NAILA has a limited capacity of 25 participants. We are seeking a broad range of participants from across Northern Alaska, with diversity in culture, gender, and backgrounds. Please understand that if you are not accepted for this cohort it is most likely due to a limitation on the spaces we have available. NAILA will be hosted April 12-17, 2019, in Fairbanks.